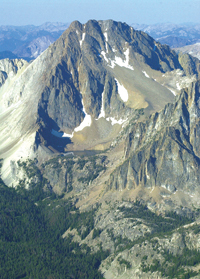 Though establishment of the Sawtooth National Recreation Area in 1972 provided permanent protection against most types of development in the White Cloud Mountains, some conservationists contend that the job is not yet finished. With continued stagnation in Congress of Rep. Mike Simpson’s proposed CIEDRA wilderness bill, creation of a national monument through presidential proclamation is being viewed as the next best alternative. The proposed 592,000-acre monument would greatly expand the protected area covered by the 756,000-acre SNRA. However, it would include 328,000 acres within the SNRA, and debate over the issue has indicated that many people are baffled by the claim that legal protection is needed for an area already protected. The Sawtooth Society, whose mission is to “preserve, protect and enhance” the SNRA, has stated that even though it remains open to persuasion, it so far sees no benefit to national monument status for the area within the SNRA, and is wary of the risks. l A proclamation could prohibit motorized use on trails within the Forest Service’s recommended wilderness area. l It could further restrict mining. l It could specify that measures be taken to protect habitat for salmon, steelhead and other wildlife. Regulations regarding motorized travel on the SNRA have been developed by the Forest Service in response to the SNRA Act. Rob Mason, central Idaho representative for The Wilderness Society, said proponents would like to eliminate additional motorized use on trails within the area that the Forest Service has proposed for wilderness designation. However, he said, proponents are willing to accept existing two-wheeled motorized use on the Frog Lake loop and the Germania Creek and Washington Lakes trails in the White Clouds. Mason said multiple attempts to persuade the Forest Service to prohibit more motorized use have been fruitless. He said that even though the Forest Service is an agency within the Obama administration’s Interior Department, he thinks the president may be willing to state in a proclamation specific direction that has not filtered down to national forest supervisors through the normal chain of command. The SNRA Act of 1972 prohibits further establishment of mineral rights, but permits development of existing rights. However, it states that the area’s natural resources, including minerals, shall be administered in a way that “will not substantially impair the purposes for which the recreation area was established.” Those include scenic, recreational and wildlife values. That section of the act has been widely accepted to prohibit development of a large mine, and the act also grants authority for the government to buy existing mineral interests, through condemnation if necessary. “It really hasn’t been anything beyond prospecting or basic exploration,” she said. The SNRA is now reviewing an application to conduct a recreational placer mining operation on the Salmon River downstream from Stanley, but Torrealday said that’s the only application that the agency has received since she began work there in 2009. She said that due to the SNRA Act’s directive to preserve scenic and wildlife values, the Forest Service has more of an obligation to consult with other agencies, including the U.S. Fish and Wildlife Service and the Idaho Department of Fish and Game, in regard to any development proposal. Even so, proponents say a national monument could provide more tools to further restrict mining. According to the ICL, there are 78 mining claims within the proposed monument and the SNRA. Torrealday said they range from a few acres to 160 acres, with most from 10-30 acres. She said the largest are a claim still owned by ASARCO at the base of Castle Peak, a claim at the end of Slate Creek Road at the northern end of the White Clouds and the Livingston Mine on the east side of the White Clouds. The SNRA Act directs that the area shall be managed in a way to “best provide the protection of the salmon and other fisheries” and to conserve wildlife values. However, monument proponents contend that expansion of the protected area is needed to fully encompass summer and winter wildlife habitat and to integrate management among two national forests and the BLM. He said wildlife management also needs more consistency over time, pointing out that agency plans can change every few years as the local districts get new supervisors. Despite the alleged benefits of a national monument, Sawtooth Society Executive Director Gary O’Malley remains skeptical.